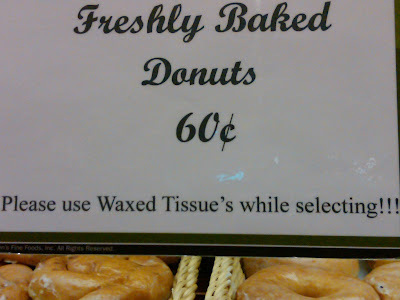 Apostrophe Catastrophes: Waxed Tissue Is ... a Person? Good going! I would have missed that one. Here's the real question: What, exactly, are we to use (of Waxed Paper's personal property) while we select our pastries? They've left a word out, and I'm so confused. Waxed Tissue is my drag name. And don't leave out the missing hyphen! What's with all the yelling in this sign? Are 3 exclamation points really necessary?